A couple years ago, our friend and neighbor Terri bought 2 of our does, Eloise and Astrid. They’re Nubian/Pygmy mixes. We thought they were so adorable that we decided with Terri to breed them to Chev, a Dwarf Nigerian, this past spring. Chev belonged to our friend, Whitney, and we rented his stud services because the bucks that we have are too large to breed with these smaller girls. Chev was a beautiful white and black buck with blue eyes — sadly, he died the week before Easter, but we were hopeful that his progeny would live on in both Eloise’s and Astrid’s babies. And our hopes came true! On Sunday, August 5, Terri called us and said, “Astrid’s in labor; come on over!” So Brett and I hunkered down with Terri in her goat barn, armed with juiced-up smartphone cameras, and recorded the whole thing. If you’ve never seen a baby goat being born, it’s a sight to behold. Warning: This is a graphic video of a live birth. If you’re squeamish, keep scrolling, man. The gestation period for goats is 148-152 days, with 150 being average. Labor can last up to 12 hours, particularly for a first-time kidding. If you know your doe is due soon, look for signs of active labor like restlessness, pawing at the ground, a bit of a glazed-over look, and separating herself from the rest of the herd. Most of labor consists of the kid getting itself into position, so it’s kind of uneventful. But when you see your doe in active pushing, you’ll likely see the birth within 30 minutes. Does can give birth standing up or laying down; I’ve seen both. In this video, you can see that Astrid is lying down for a little over 30 minutes (I edited out the uneventful boring parts for you), while bleating and pushing. In a normal, healthy kidding, you’ll usually see a bubble first — this is the amniotic membrane and it’s normal. You should shortly thereafter see either a nose and/or a front hoof or two. It’s rarely necessary to step in and help out — the vast majority of births are normal and healthy, with the doe doing her job on her own. I try to be on hand as much as possible “just in case,” but it’s never been necessary for me to intervene. (Read this very thorough blog post by Deborah Niemann Boehle for how to know when you need to step in and help…and when you don’t.). Baby goats stand up very quickly on their own; ours average about 10 minutes. The mama will work hard to clean the kid up — again, I’m a proponent of letting Mama do her thing. I’m on hand and will step in if needed, but I leave everyone alone otherwise. 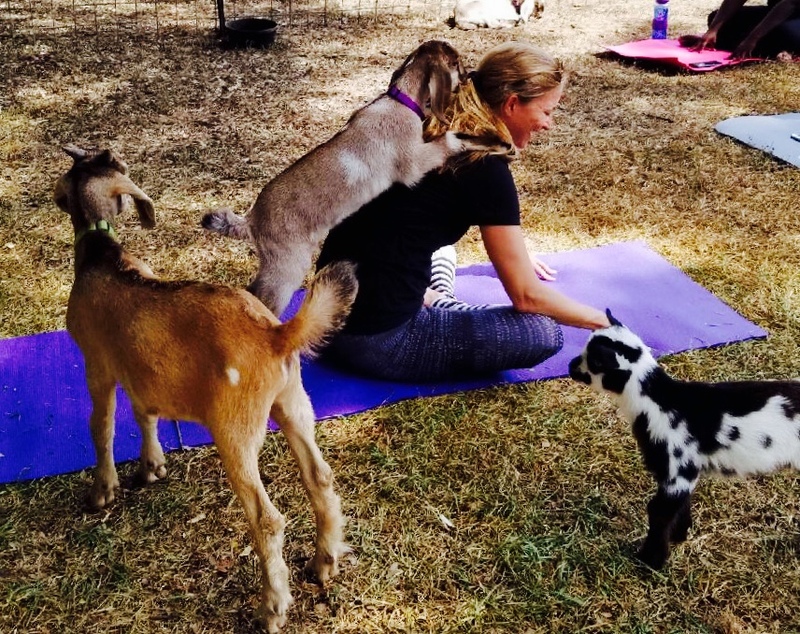 Three weeks after she was born, Bijoux was the star of Baby Goat Yoga here at Berkeley Farm (she’s the black and white one in the lower right). The jumpy goat on our instructor Anna is Bijoux’s cousin Belle. Most of our goats are Nubian mixes, and are year-round breeders, so we’ll have no more babies for this year. However, we recently bought a pair of breeding Angoras, which are seasonal (fall) breeders — so baby goat yoga will resume next spring 2019! Stay tuned for those updates, or check out our Facebook page Berkeley Farm for more events.